In this 5 minute post, we will do quick start for MongoDB on Windows. I will show you the way to connect to MongoDB Server and to start the administrative shell. Next navigate to folder in which you unzipped the downloaded binaries. You will get below executable file downloaded. 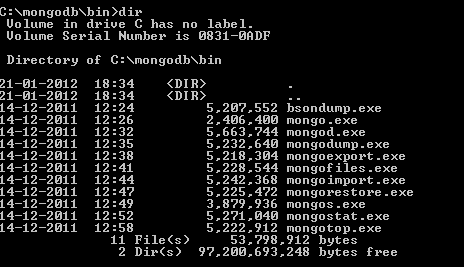 Most important exe are, Mongod.exe to connect to mongo database server and Mongo.exe to start administrative shell. Once server is started, you can start administrative shell as below by executing mongo command. If you want to insert data you can do that as below, below command will create a database called debugmode [only when first row is inserting] and then add name as dj. You can explore Help option to know more about the executable and commands. In further article we will go deeper on same and explore working with MongoDB and CSharp.